On November 12, 1981 the proposed construction of Orme Dam was declared illegal by the Federal government and by the Department of the Interior. This landmark decision came after a 13-year legal battle between the FMYN and state and federal government over a dam that would have flooded the reservation and forced its tribal members to relocate from their lands. 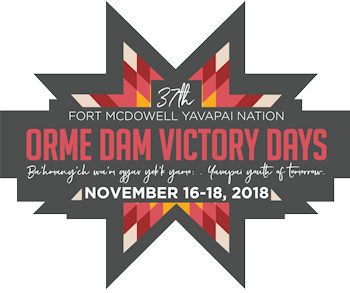 To celebrate this historic occasion, the Fort McDowell Orme Dam Victory Days Celebration takes place November 16th & November 17th, 2018 at We-Ko-Pa Golf Club. You may access a copy of the Tournament Registration Form by CLICKING HERE, or you may fill out the information in this online form and then click SUBMIT at the bottom of the page. Please Contact We-Ko-Pa Golf Club for Registration or if you need additional details. By submitting this entry form, I agree there are certain risks inherent in the game of golf and I accept personal liability for all such risks. We’re pleased to host a golf tournament for our Juniors in honor of Benedict Smith, Sr. All one-day tournament details are described in the flyer below. Please download the flyer to register your junior golfer today, or click the Online Registration button below to learn more information about the Junior Golf event and to register your son or daughter through our friendly online registration form.